Adventures in Middle-earth was an ambitious and risky prospect, but I was pleasantly surprised to see how well Cubicle 7 blended Tolkien’s style into the 5E mechanics. The only area where the player’s guide needed some support was in tools to help run the game, and for that we have the Loremaster’s Guide. This book expands on the player’s guide in nearly every direction, offering new insights on the adventuring, fellowship, and audience phases. It also reveals dark truths about the lore, helping to make for a more complete setting. The adventure hooks along with these sections are a genuine treat, with thoughtful advice on how to roleplay in Middle-earth. The book also provides a collection of antagonists which is well realized, if unfortunately small. Finally, the Loremaster’s Guide gives you some well-needed tools, providing additional lists of magical items, a discussion of magic in general, and providing antagonists to challenge the party. The art is, as ever, filled with the longing and melancholic tone of Tolkien’s works. There is a nobility to the lands and peoples of the Wilderlands, but that grandeur exists in the shadow of a sinful history. The great silences of the characters and landscape bely something sinister, like the specter of death itself is just about to close on you. The men and women who travel the Wilderlands are watchful, even in rest, for every shadow carries threats. The maps that come along with the book, depicting the Wilderlands and Lake-Town, do not sacrifice utility for artfulness. Many specifics of the setting are left to future supplements, but the setting chapter breaks down many locations touched on in the player’s guide to provide you with in depth descriptions of their landscapes (a boon when the time comes to take your players through them). The locations also have adventure seeds, which are pleasantly creative. They are tailored to each area but also range in time: some are small ideas ideal for one-shots, while others could define the arc of an entire campaign. They could easily feed into one another if you want to make the best use out of them. It can be hard to imagine what adventuring in Middle-earth might be like, making these seeds one of the most useful parts of the book, and many could slot into other settings with some modifications. One might find these descriptions limited as compared to other books, given how most of them are limited to talk of geography and landmarks. That is true in some ways, but the real utility lies in exploration itself. This game is about venturing into the unknown, and even coming to a new area and discovering its sights is a major focus of play. The book also has a series of timelines, broken up into the three ages of Middle-earth. Many of their entries contain secrets reserved only for the Loremaster, to help delineate information that players might know and information they have yet to uncover. Some of these secrets are ancient enough or so high level that it will take a skilled Loremaster to make them directly relevant to the game, but then again that is the point of a setting overview. Lake-Town is the most developed section of the setting chapter; as the sole hub of civilization in the Wilderlands, it makes sense that it would be better understood. As the closest thing to a city around, it’s broken into different neighborhoods with their own descriptions and adventure seeds, which is a nice touch. It also includes a unique portion of the fellowship phase if you start here, allowing you to gain special bonuses for starting in settled territory. You can purchase specialized equipment to help you along your journey, in a sensible but wide array of items. This small change goes a long way to help hammer home the themes of preparation that lies at the core of the game. The Loremaster advice section focuses on helping you understand the tone and themes of a Middle-earth game. It helps you develop not only what you will do, but how to enforce those themes for your players. If you hadn’t realized it before, this is where it truly dawns on you how different this game is from D&D. While they share mechanical and historical spines, the two have drastically different themes and goals, and are the better for it. It also has some well considered advice on interacting with your players and presenting them information. It also helps guide you through the uncharted landscapes that make up Tolkien’s writing itself, offering the more useful section. How we interpret and present this material is informed by the source, and this book does good work to let you feel that the setting is more alive than we might have imagined, not the intransigent monolith that something as well-established as Tolkien can feel. The book doesn’t feel much of a need to provide what we might think of as “traditional” GM advice about how to structure adventures and wrangle players. As an established roleplayer I tend to skip these sections anyways, but I can understand how newer players would feel there’s something missing in this book. There are a few optional rules that come alongside these, but these are so limited that they feel like an afterthought. What doesn’t feel like an afterthought, however, are the tables they give you to codify and speed along your games, like the raw journey table of all the outcomes. It is strange that these are in the middle of the book where you would have to flip during play, rather than right at the end for ease of use. The Audience section is the most developed of these three chapters. Because it tells you about who you might be speaking to, it provides extra lore, information on other cultures, and stats for NPCs you might meet all at the same time. Most helpful of all, and a trick I encourage you to include in your own NPC write-ups, are the simple inclusion of the motivations end expectations of each character. Motivations let you know what they want, and expectations tell you how they want to be treated. It’s a very thoughtful way to make the usual block of text far more useful for your game. We also finally get some antagonists near the end of the book, in a chapter that is mostly useful in its presentation. It more than lay down enemies to fight; it gives you tools to make fights happen in interesting locations, where the landscape itself provides obstacles to be wary of. Everyone running a combat heavy game should harvest this section for their games to make fights more dynamic experiences. The bestiary itself should fill you with dread just reading it. Even at lower challenge ratings, these monsters are a real threat, and should give your party cause for concern whenever combat does take place. There are adventure seeds for many of the antagonists, to give them greater context and character. You will see varieties of the same thing occasionally, such as orcs and goblins from different areas, but also new creatures to amp up the horror elements. There is one considerable drawback, however: the challenge ratings top out at around 6, so you will be out of luck when your party gets to higher levels. Sure, even low level monsters will pose a huge threat to an experienced party if they are in groups or using intelligent tactics (both of which are assumed in this game, in all fairness) but this is a far cry from the type of bestiary that would get you through a full game. The magic item section begins with a surprisingly enjoyable discussion of wealth in general, and how money is worth more in this setting than in D&D. You also understand quickly that the rarity of magic separates this from the magic item spiral of usual D&D, and that you should be cautioned to be very sparing with magic items. Another intelligent piece of advice is to not let your players know what magic items actually do, until players discover their properties organically. I was very happy to see that the writers made some changes I wished for in the player’s guide: some magic items give you new ways to spend inspiration and hit dice to fuel magical effects. Doing so allows you to perform impossible tasks which get more powerful the more resources you spend. What might not seem obvious at first is how much this changes the dynamic of the game, and all for the better: an item you get at first level will scale with you as the game goes on. The “dead levels” problem will be even less of a concern, because every level will give you more dice to empower these abilities. You will also have to decide whether you want numerous small effects, plentiful healing, or a single enormous move when you need it. While the book gives you additional magic items, it also gives detailed, well explained rules as to how you would build your own. Near the end the Loremaster’s Guide also takes space to discuss magic in general. It stresses that magic is a rare and dangerous thing, but does discuss the forms by which you might encounter it. No one is going to be throwing around fireballs, but you will see oaths and curses, mystically empowered songs, and items suffused with ancient might. For those who do want to raise the level of fantasy, the book does provide options for reskinning other spells, and provides a list of Middle-earth appropriate spells for those who are determined to play a game where wizards walk the earth, or merely to empower their foes. 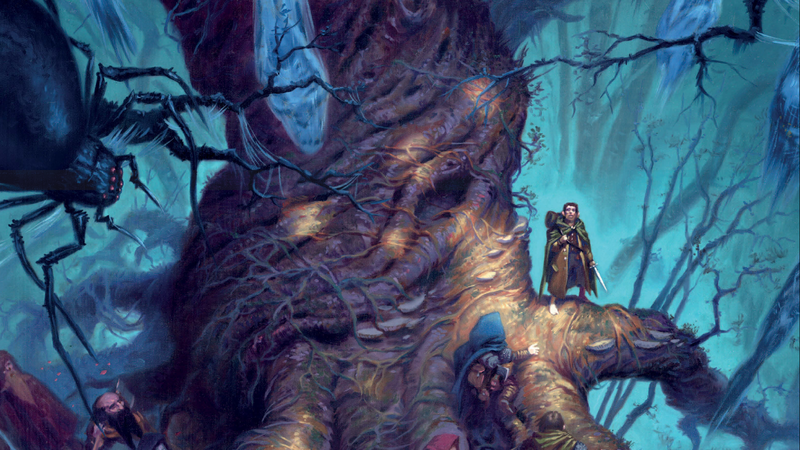 The Loremaster’s Guide is an excellent supplement, but stops short of feeling totally complete. The setting and monster sections only help to start the game, and the entire book seems like it is geared towards helping you get started, rather than being an ongoing resource. I’m sure that all of these will be filled out in the separate adventure supplements (some of which are already out). Some experienced GMs familiar with the lore might consider skipping this, but the antagonists and location writeups that are provided go a long way towards making the purchase worthwhile. Casting a wide net over potentially useful advice, the Loremaster’s Guide is an excellent way to get you started playing in Middle-earth. Real thought and care went into making the Wilderland’s a playable setting, and while you may rely on it less and less as the game goes on, it’s one of your best tools to begin your game.